The Duke and Duchess of Cambridge today kicked off their 5 days tour to Poland and Germany. 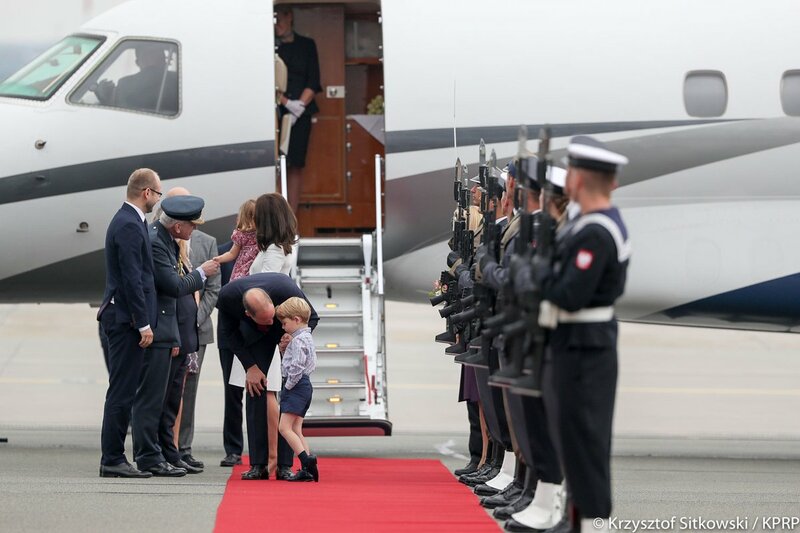 Prince William and Catherine arrived in Warsaw with their kids Prince George and Princess Charlotte. 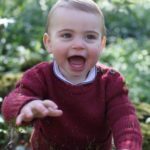 Prince George seems shy in the new environment as the royal reporter Victoria Murphy reported about Prince George kicking his father’s shoes while at the same time Princess Charlotte who was being carried by her mum Duchess was enjoying the surroundings more openly. 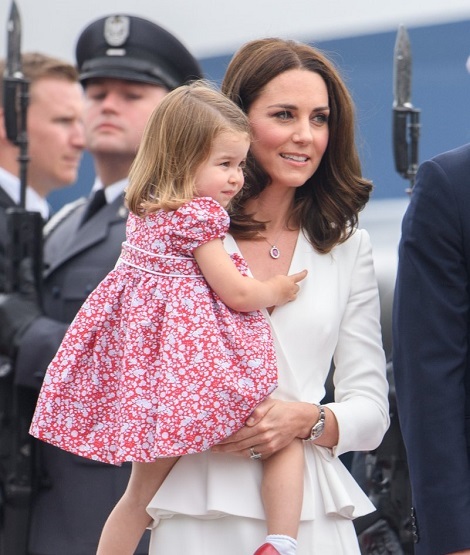 A look at the arrival of Cambridges in Warsaw, Poland. The Duke and Duchess will prioritise opportunities to meet the young people of both countries; from entrepreneurs, to mental health campaigners, and bright young talents in music and the arts. The tour will also take in the stunning scenery and architectural feats of Poland and Germany. 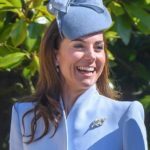 The Duke and Duchess will wander through the beautiful market of Gdansk flanked by terracotta houses and cobbled pathways; they will take part in a rowing race on the Neckar River; and they will tour the spectacular Elbphilharmonie Concert hall in Hamburg. The five day tour will also include time acknowledging the complex 20th century histories of each country with visits to the Warsaw Rising Museum, Stutthof Concentration Camp, and the Berlin Holocaust Memorial. 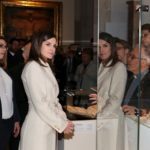 At each location Their Royal Highnesses will meet survivors of these periods, who will describe their personal experiences. Once settling the kids in a safe environment at Belvedere Palace in Warsaw where they will be staying during Poland tour. 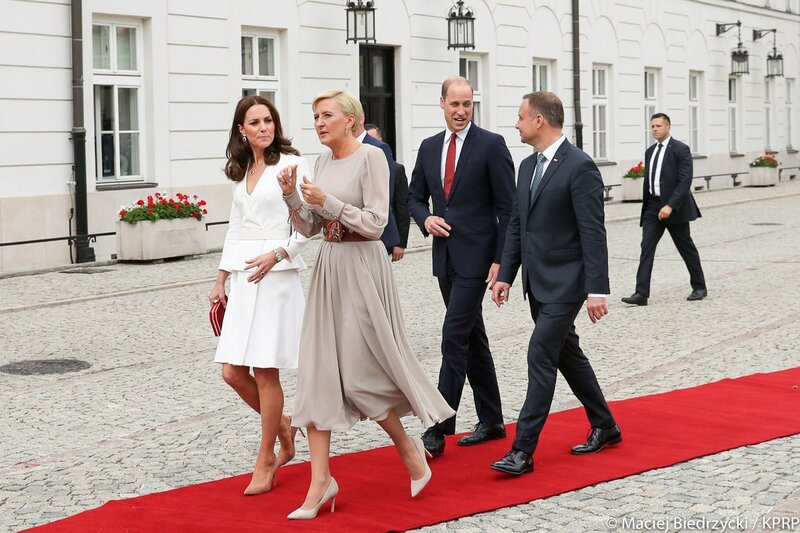 William and Kate were officially greeted by President Duda and the First Lady at the Presidential Palace. 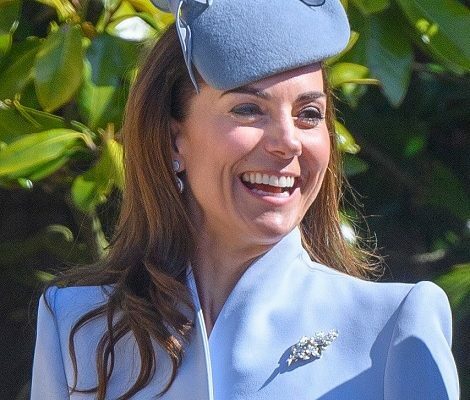 For the first family tour of the year 2017, The Duchess opted for her signature designer Alexander McQueen today. 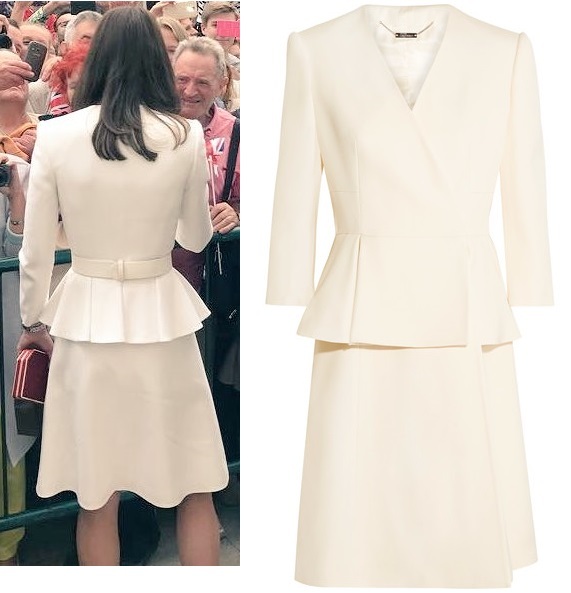 Kate wore the ivory Wool and Silk Blend Twill Peplum Coat thanks to Kate’s Closet for the quick dress id. The impeccably tailored in Italy from mid-weight ivory wool and silk-blend twill coat features a feminine V-neckline and gently kicks out at the waist into a rippling peplum that softly folds at the back. It has three-quarter sleeves, a concealed front closure. 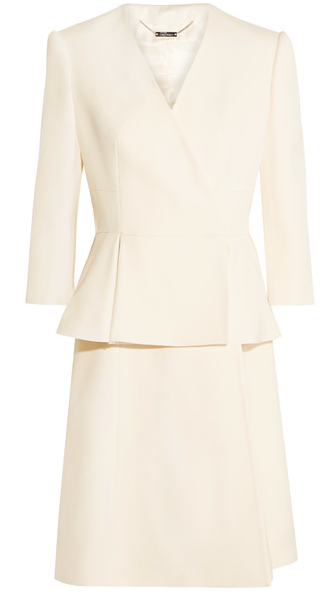 The coat is available at Net-A- Porter for $1538 that is 50% of the original retail cost. 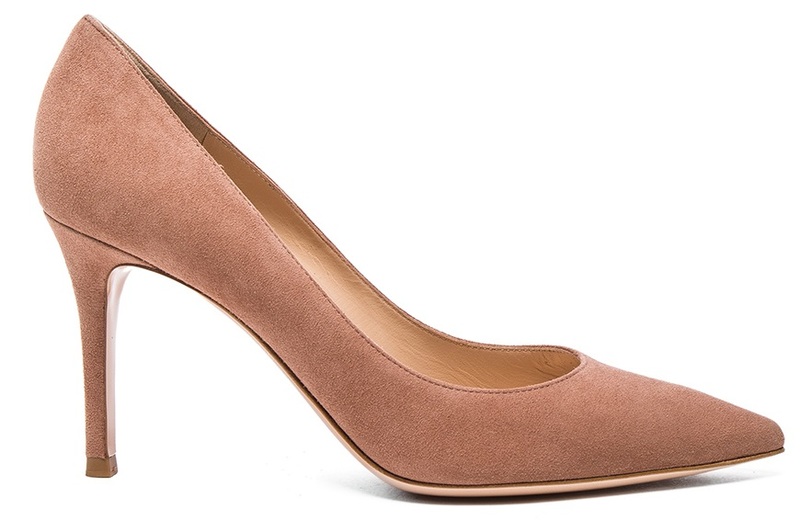 Duchess paired the outfit with her trusty Gianvito Rossi praline suede pumps. Shoes are currently available at Gianvito Rossi. Today a new set of accessories was debuted by Duchess. It includes a pair of earrings, a necklace and a ring made of ruby surrounded by diamonds. Kate’s carrying her red Jenny Packham ‘Casa’ clutch and wearing her Cartier Ballon Bleu watch. Duke and Duchess received a warm welcome from polish people upon arriving in Warsaw.Duke and Duchess received a warm welcome from polish people upon arriving in Warsaw. Later on the couple visited the Warsaw Rising Museum and paid tribute to those involved in the Polish resistance uprising of 1944. Duke and Duchess at Wall of Remembrance reading the names of those involved in the Uprising, including British RAF pilots. 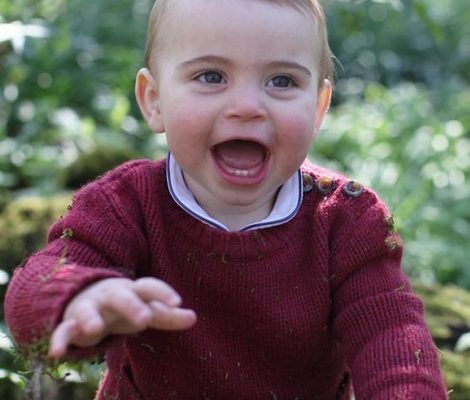 Tonight Duke and Duchess will attend the Queen’s Birthday party hosted by British Ambassador to Poland.